American lost a close one at home, 59-56 to Mount St. Mary's. Here are five key plays/sequences from the game, which dropped the Eagles to 3-7. The Mount entered the game very good at taking care of the ball, but struggled early as AU turned miscues into a nine-point lead. While American struggled shooting in the first half, it had one of its best offensive rebounding performances in recent memory. 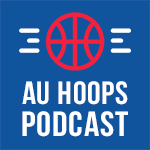 AU rebounded 50% of its misses and turned them into eight second-chance points. After a rough start to the second half, the Eagles finally attacked the 1-3-1 off the dribble drive for points on four straight possessions as they fought back from down seven. Overall, AU played pretty solid defense and contained dynamite point guard Junior Robinson. But The Mount took control late with a postup spin move layup and another easy basket off the pick-and-roll, which was their go-to set for most of the night. Sa'eed Nelson gave AU a chance late, converting on a drive to the rim — but missing the free throw — and then scoring again in transition to cut The Mount's lead to one. After a pair of MSM free throws with 7.9 seconds left, Nelson dribbled left around two screens, pump-faked and actually had a decent look, but shot it short at the buzzer.